If the waffle stitch looks intimidating, you are mistaken! You only need to know how to crochet double crochet (DC) and front post double crochet (FPDC) stitches to make a piece with this awesome texture. The waffle stitch fits right in with modern decor right now and it looks great in both solids and self striping yarns. I have seen many beautiful Caron Cakes blankets crocheted with the waffle stitch as well! Here is a sneak peek of my next free pattern coming to the blog using....you guessed it! The Waffle Stitch. 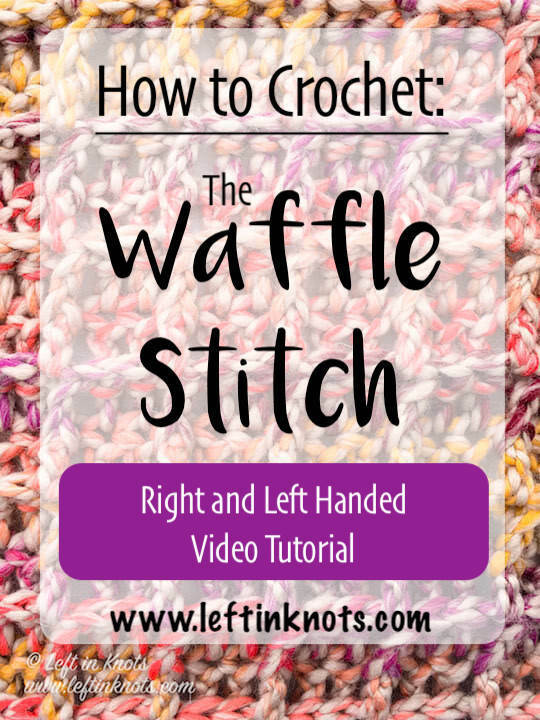 So now you're ready to learn how to crochet the waffle stitch, right?! Grab your hook and yarn and follow along with me :) Then come back and show me what you make with this stitch in my Facebook Community or by using #leftinknots on Instagram. Want more crochet in your life?! Sign up for my free newsletter to hear about new free patterns, yarn deals and giveaways from Left in Knots!